Jill Elaine Hughes was kind enough to offer up a Q&A for you to get to know her better! Please enjoy her answers, and don't forget to scroll to the bottom for your chance to win a copy of her book! Honestly, because I have to. If I don’t, I’ll go nuts! I have to say it was my high school English teacher, Mrs. Stevens. She was the toughest writing teacher I ever had, and I credit her with giving me the tools I needed to be a professional writer---both a journalist and an author. She was so tough on her students that most of them hated her (I did too, at the time), but I learned to appreciate what she instilled in me later on, especially when I got to college and then out on my first professional writing jobs. Diet Coke, tea, and granola bars. I’ve actually been a professional writer for my entire career, either as a journalist, corporate-communications writer, or as a novelist. Though I have also worked odd jobs as a waitress, as a temp worker in offices, and as a custom art framer back when I was in high school. 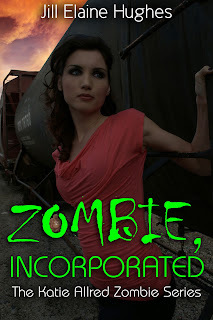 I think it was probably my current New Adult paranormal release, ZOMBIE, INCORPORATED. The heroine of that book is 18 years old and it’s told in the first person, plus she is a very different kind of person than I am. Stepping into her shoes every day to write her story was tough. Plus, this is not your typical zombie book. It’s more psychological. Instead of the zombies being in-your-face, blood-guts-and-gore, it’s all very shadowy and uncertain. You don’t know for sure who are zombies and who aren’t---which just makes it that much more dangerous! I had to spent a lot of time planting clues and subtext, and building a plot that resembles a psychological thriller (think old-school Hitchcock) more than straight horror. I think you can make your own luck. No, but I’m a classically trained singer. Who are your greatest paranormal fiction influences? I’m very into old-school, classical paranormal mysteries that was very language- and subtlety-driven. I love Mary Wollstonecraft Shelley, Bram Stoker, and Daphne DuMaurier. I also love early Stephen King (not crazy about his new stuff, though), Jane Yolen, and Neil Gaiman.